Every Friday I review two books, usually comic books from NetGalley. This week as I am trying not to be distracted by the various noises made by my dog’s stomach, we’ve got a sheriff moving to a new town trying to escape her past, and an aging hero trying to recapture it. Clara Bronson is tough to get along with. She has fought hard to become who she is while balancing being a single mother and a sheriff. 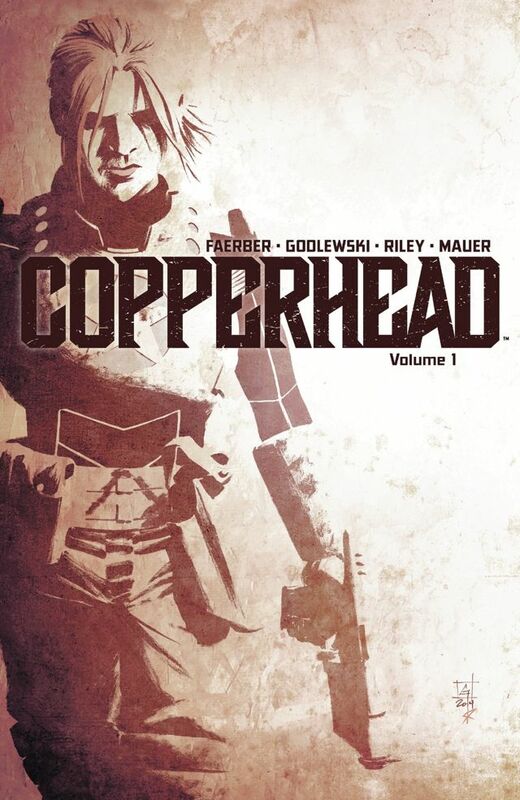 But her uncompromising attitude has often run her afoul of her superiors, and now she needs to make a fresh start on the backwater planet of Copperhead. There she must deal with a deputy who resents her taking his job, and her race taking their planet. There’s corrupt tycoons, relics and wounds of a not long finished war, and a massacre on her first day. This is more of a western view of a justice than a police procedural. While there is ostensibly a murder and an investigation, the case is solved not with evidence, but with grilling the right people and holding them in jail till they tell the truth. Bronson has some clear racial biases against the “arties” artificial humans created to fight the war against the indigenous lifeforms of Copperhead. Even when one saves her son, she is suspicious of their motives since they were created only to kill (think Blade Runner). Her deputy “Boo” has a dry sense of humor, and even though he clearly resents Bronson’s presence is a consummate professional and warms to her pretty quickly. We get a glimpse of his war history during a scene where he is chasing down a subject (though the concluding action of that scene is a bit muddled). Everyone in this story has a past they are trying to run from in one way or another. Faerber’s characters are interesting, but not particularly likable at first. I personally found the solution to the case a little unsatisfactory but it fit with the western motif of this ostensibly science fiction story. Given more time in this universe I think these could be people you could really care about. I love the design of the races and uniforms (complete with bullet holes from the previous occupant). This one’s got style, and places to go with its character’s histories. Definitely worth the look. When an old enemy surfaces threatening the existence of inhabited worlds, an aging super-hero must bring together his old comrades and new recruits to stop it. To do so he may need to resort to methods he once fought to stop. Oh and he’s also a womanizing scoundrel with a marriage on the rocks with the daughter of a super-villain he once defeated. Think The Incredibles on a galactic scale with a far less stable marriage at the center. This volume contains the opening three issue arc of EGO’s and a one-shot featuring some of the new team members, plus a prequel story told entirely in tweets. Moore has a very imaginative sense with super powers, and is very good at revealing his twists a bit at a time. The big twist (involving the nature of our unreliable narrator) was a bit of a let down, but the revelations about the exact nature of the enemy, and who of the new recruits would actually be effective in combat (and where all these recruits came from in the first place) was really interesting. Both of these comics are characterized by a rough edges sensibility, but Storms has a really good handle on how to portray the scale of certain conflicts. Moore’s work is a little tongue-in-cheek and a little unpolished, but definitely entertaining. I also enjoyed the issue 0 story as it provided a decent amount of background to one of the initial characters. I haven’t seen too many examples of people using twitter as a successful story telling medium, but this one worked. The production schedule for this seems to be slow, but we are finally getting an issue 5 and 6 so hopefully there will be more of this to enjoy in future. PS. I’ll be taking next week off, returning on Monday March 23rd. That week we’ll have more Trube on Tech, thoughts on writing and Chapter Six of The Sky Below. Stay tuned!